Marvel's patriotic superhero is already suiting up for both high-definition formats this October! In an early announcement to retailers, Paramount is preparing 'Captain America: The First Avenger' Blu-ray/DVD/Digital Copy combo pack and 'Captain America: The First Avenger - 3D' Blu-ray 3D/Blu-ray/DVD combo pack for a release on October 25. 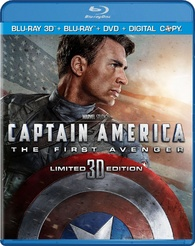 The Blu-rays will feature 1080p video, a DTS-HD Master Audio 7.1 soundtrack, and preliminary supplements include: Audio Commentary with director Joe Johnston, cinematographer Shelly Johnson and editor Jeffrey Ford, Outfitting a Hero, The Assembly Begins, Howling Commandos, Heightened Technology, The Transformation, Behind the Skull, Captain America's Origins, Deleted Scenes, Marvel One Shot: A Funny Thing Happened on the Way to Thor's Hammer, and The Avengers animated series trailer.